Philippines has one particular holiday which we all look forward to celebrate. Since 85 percent of Filipinos are Catholics, Christmas is a big part of Filipino culture. Preparation for Christmas started as early as September, malls,streets and homes are heavily decorated and you can hear the Christmas Carols everywhere, oh what a delight. My heart is nostalgic and like a little child I am so excited to welcome Christmas as always. Come November 15 and I will start the preparation of my Christmas Cake. After that I will start to make some bars and squares for give away to my friends, colleagues, my children's friends and in some cases, my son will bake and sell too. Whenever I think of something to give away, I know that bars/squares with caramel wont fail me. 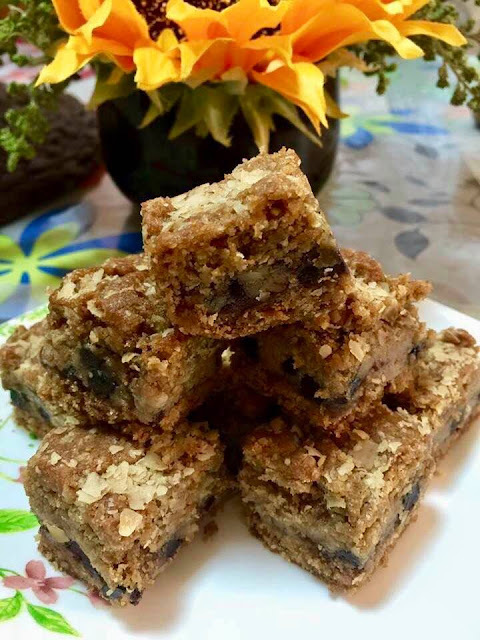 I make fully loaded squares with caramel, chocolate chips and pecan. Last year my son also brought some for his classmates and yes, it was a hit. They all love it! What made me laugh was one of his classmates told him she is on a diet but she would like to have some for her mom. Of course my son did bring some for her mom. I find the gesture so thoughtful. I wanna be her mom too... LOL! In a saucepan, combine all ingredients except cornstarch with water. Cook until thick and caramel in color for about 30 minutes, then stir in cornstarch with water, mix until caramel is thick. Spread the first half of the mixture on a pan, bake for 10 minutes. While baking proceed on making your caramel. After baking the first half, let it cool first then sprinkle chocolate chips and pecan on top, finally pour over the caramel. Then sprinkle the second half of the crumbly mixture. Bake for another 18 minutes. Cool for an hour before slicing or better chill in the fridge for two hours. it will give you 24 slices. 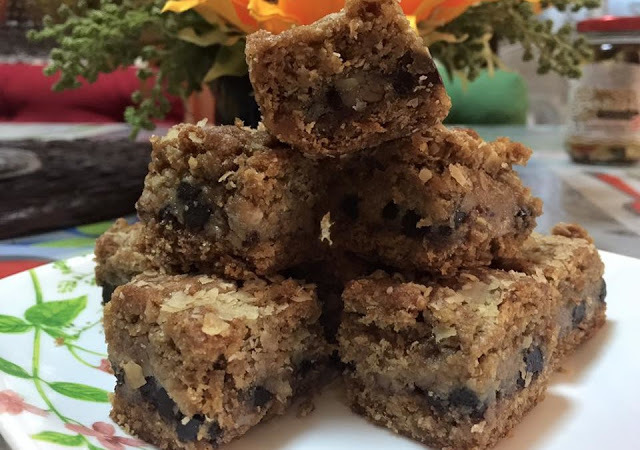 Your caramel chocolate oat squares sound fabulous. Thank you for sharing at Best of the Weekend. Happy Thanksgiving. Hi Amy, this is one of our old time favorites and as always it never fails me.Have a great weekend. Ohhh this sounds so amazing! Thanks for sharing at the What's for Dinner party. I hope your Thanksgiving is full of blessings. Hello Helen, thank you for the wishes. Have a great weekend. thank you for coming over. Oh my...those look wonderful. Found you off Cindy's blog - Creations by Cindy. These look and sound so yummy! I had to pin!! Thanks for sharing! They look delicious! Thanks for sharing with us at the To Grandma's house we go link party, see you next week! Wow - like the Fiesta Friday. Thanks for sharing. Very nice, Mareliz! I'm definitely saving this! Thank you Angie, Im glad you like it. See you on Friday. Oh wow Miz Helen. thank you so much for the feature.You are most welcome and i will be there again and again. Have a great week ahead.